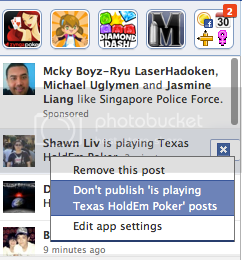 Recently, I just realize that the Game Activities are available on my right Facebook panel (Game Ticker). Due to certain reason, I prefer to keep all this info to myself. For that reason, just simply click on the (x) mark that appears. Next, click on ‘Don’t publish is playing (Game name) posts. Afterward, there will be not be seen for that particular game on the games ticker. How to disable your Facebook Timeline ? how to turn it back on? Facebook has deprecated the Games and Activity setting and replaced it with an app privacy setting. The new app privacy setting gives you granular, per-app control over who sees stories that apps publish about you. This gives you the option to let some apps share broadly, while restricting others to share with a more limited audience.